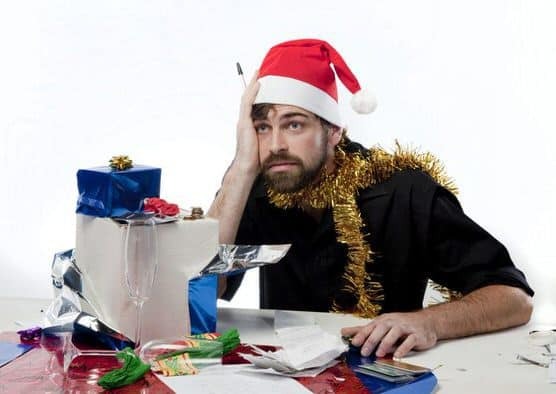 5 tips for coping with the holidays. Do you look forward to the holiday season? Many people do and they look forward to visiting family and friends and catching up on the past year. You may be looking forward to a break from work and you will have lots of time on your hands. For many people though, it is not all fun and games. It can be the most stressful time of the year and many struggle to cope with it all. There are many things that are expected of you during the holiday season. And the pressure can begin many weeks in advance. There are social events to attend such as work parties. Everyone seems to be in great form everywhere you look. People are out shopping for gifts and generally getting ready for the festivities. But it can all get too much especially if you suffer from social anxiety. This can be a horrible time of the year and you have to endure it. The American Psychological Association says eight out of ten people get an increase in stress at this time. For many, an increase in stress levels can lead to episodes of anxiety and depression. This is especially true if you are dealing with social anxiety disorder. The Mayo Clinic shows that depression is commonly experienced over the holiday season. But don’t despair just yet. You can enjoy the holiday season by learning some tips and tricks to help lower your stress and anxiety so you can get on with your life during this time. You may enjoy shopping even if you have social anxiety. You may go out early or late when there are not so many people around. But your anxiety levels can increase due to the amount of money you are spending. Couple this spending with social anxiety disorder and the problem is much worse. So in order to help you with these expenses, you need to get organized and set a limit on what you are going to spend. Then stick to that budget and remove some of the anxiety from your life. You can experience a lot of stress during the holidays. And a lot of this stress is because of financial pressures. It is important to set a budget and stick to it. Having a budget in place will lower your stress levels and reduce your anxiety also. This will help your efforts for coping with the holidays. So check what you have and how much you can afford to spend on presents, food, taxis and anything else you can think of. Then make sure you stick to your budget. No excuses! Exercise is very important at any time, but particularly during the holiday season. Being active will lower your stress levels and will help to lift your mood. By exercising you release endorphins which give a positive feeling to your overall mental health. Exercising will also help you from piling on extra pounds during the holiday season too. It can be a really hectic time of the year, but you need to find some time to exercise regularly. You don’t need to do workouts in the gym. A half an hour three times a week is plenty. Walking is one of the best forms of exercise, as is swimming or cycling. So make sure you have a plan and that you stick with it. Like I said, the holiday season can be a really busy time for you. So you need to make time for yourself. Everyone seems to be so busy at parties and shopping. It can seem so hard to get away from it all. A good idea is to visit with old and trusted friends that you can relax with. You may not have seen much of them during the year, and now is a great time to catch up. Remember that you do not have to force yourself to do anything either. Plan your time and your visits and do not put any extra pressure on yourself. Plans are made to be broken. Don’t be hard on yourself if you feel it’s all too much. Your health is important so make sure to listen to what you really want to do. If you plan to have people come and visit organize everything in advance. Ask someone to help you out. Be honest with them. They will help you out and take some pressure off you. You don’t have to do everything yourself. That is what friends are for. Look after your health. Most people overindulge during the holidays. This excess leads to fatigue and feelings of regret. You do not have to follow suit. Don’t follow the sheep. Try to be moderate during this time and you will stay healthy, reducing your stress levels at the same time. Of course, you can still have a great time. Eat some healthy snacks before parties and you will not eat so much then. Partying is really tiring also, so make sure that you don’t wear yourself out. Get plenty of good sleep. A lack of sleep will increase your anxiety and stress levels so look out for any signs that may surface. The holiday season is a time for families to get together. But this can bring its own problems. You may have to endure someone you don’t like. It happens all the time. You cannot get along with everyone, but at this time it is difficult to avoid them. Don’t let anyone ruin your experience though. Switch off and find someone else to talk to. Remember you will never change someone else, so change how you handle them instead. Stay grounded and surround yourself with the people you enjoy. Too much alcohol at parties causes problems. Even the ‘nicest’ people can turn on you, so be careful and keep a close watch on things. Looking out for yourself is your main concern. Especially during the holiday season. Stress can build up gradually during this time. Be aware of how you are feeling and take steps to make sure you have a happy and relaxing time. You now have a plan in place for coping with the holidays and to enjoy family and all that this wonderful time of the year brings.